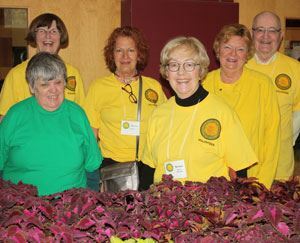 Joanne Witt, of SNAPD, posted ten great photos of The Richmond Hill Garden & Horticultural Society's May 13, 2017 Plant Sale at the McConaghy Centre to the June 2017 Edition of SNAPD Richmond Hill. Most of the plants at this year’s sale were grown by our own members, either in the greenhouse at the Alexander Mackenzie High School, or in the gardens of our members. Click here to view all the SNAPD photos of our successful event. 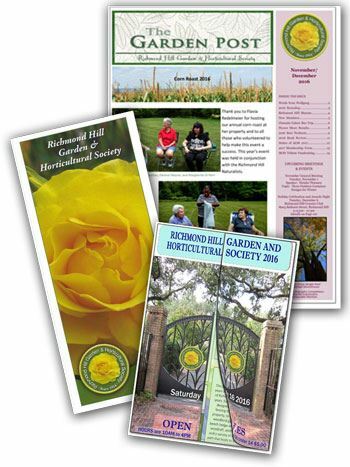 The Richmond Hill Garden and Horticultural Society is pleased to announce that we have received an Ontario Horticultural Association Pollinator Grant to purchase pollinator-friendly plants and create pollinator habitats or nesting sites at the community gardens that we maintain around Town. 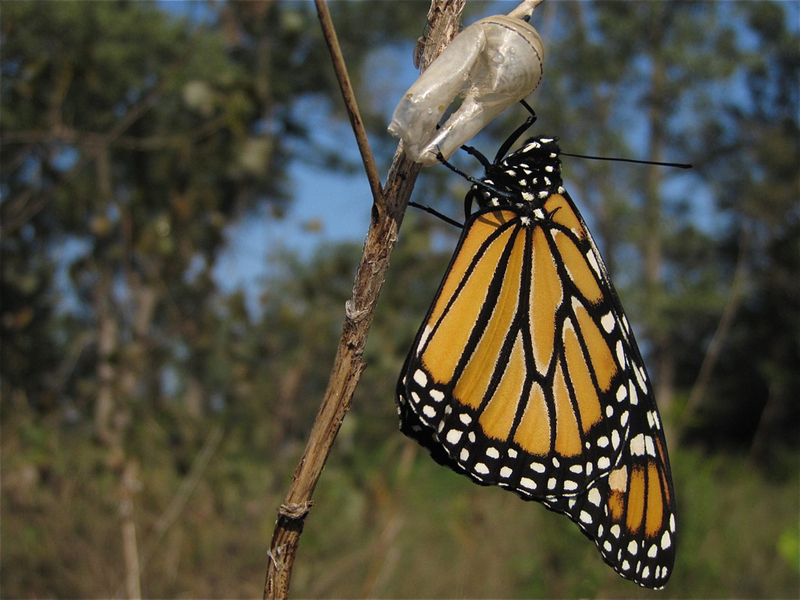 This grant is a component of the Ontario Horticultural Association's Pollinator Initiative, described on page 2 of the spring 2017 issue of the Trillium newsletter (click here). The May-June issue of The Garden Post, available to our members (click here), contains more information about the District 15 AGM, including a photo of our delegates. During a gala celebration at the Richmond Hill Centre for the Performing Arts on September 29, the following gardens were announced as having earned the highest number of points during the 2016 Richmond Hill Blooms judging that took place in August. 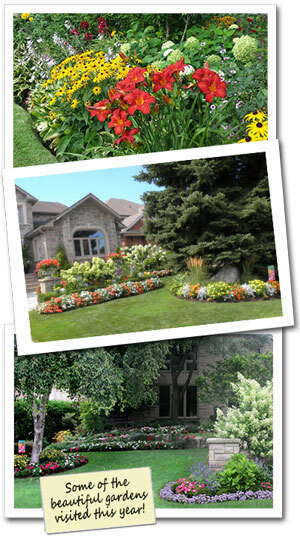 Congratulations to the owners of these lovely front gardens! A map of Richmond Hill Wards, published by the Town, is available online (click here). Our society delegates to the 2016 Ontario Horticultural Association (OHA) Convention that took place in Kitchener, Ontario from July 29 to 31 brought home several awards this year, fully documented in the Fall issue of the OHA's Trillium. As the OHA is made up of 270 societies and more than 30,000 members, it is an achievement for us to bring home awards again this year. The September-October issue of The Garden Post, available to our members (click here), contains a reprint of the award-winning “Gardening Success” short story, as well as photos and reports from our event delegates. 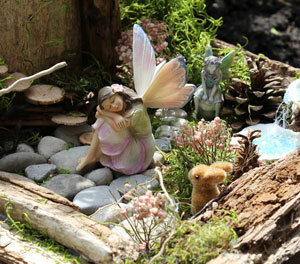 The SNAPD Richmond Hill team of Joanne and Jonathan Witt visited the ten gardens participating in the Richmond Hill Garden & Horticultural Society's 2016 Open Gates Fairy Garden Tour, and were inspired to take many gorgeous photos. Click here to enjoy their photography. 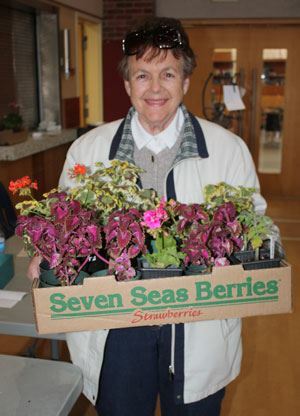 Joanne and John Witt, of SNAPD, posted twelve great photos of The Richmond Hill Garden & Horticultural Society's May 7, 2016 Plant Sale at the McConaghy Centre to the June 2016 Edition of SNAPD Richmond Hill. Most of the plants at this year’s sale were grown by our own members, either in the greenhouse at the Alexander Mackenzie High School, or in the gardens of our members. 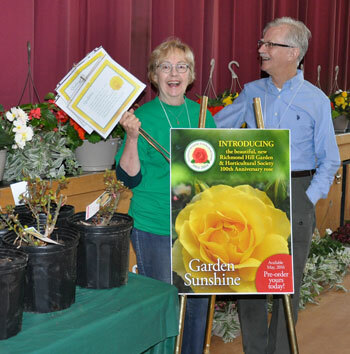 As well, the Garden Sunshine rose, honoring our society’s 100th anniversary, made its debut. Click here to view all the SNAPD photos of our successful event, which included garden accessories, books, and hand-crafted items from L'Arche Daybreak artists. 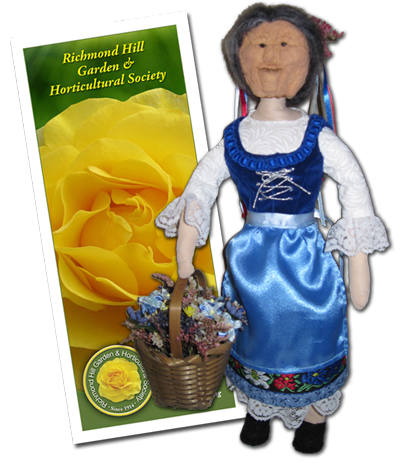 As noted in the May 5th issue of The Liberal newspaper (click here for article), the Garden Sunshine rose, commemorating the 100th anniversary of the Richmond Hill Garden and Horticultural Society, has arrived. If you didn’t pick up one of these beautiful, fragrant, disease-resistant roses for your garden at the society’s May 7th Plant Sale or at the May 14th Healthy Yards event, don’t despair. More roses will be available at the society’s Mill Pond Splash booth on Sunday, June 5th, and at our upcoming General Meeting on Tuesday, June 7th. 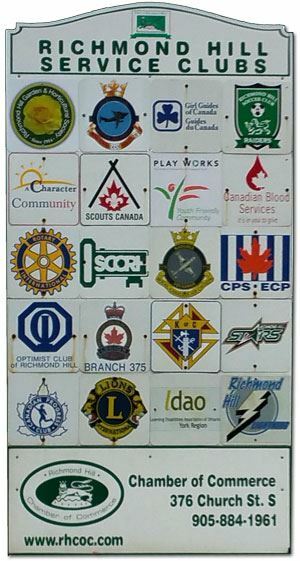 Earlier this month, the Richmond Hill Garden & Horticultural Society logo was added to the upper left corner of the four Service Clubs signs that greet residents and visitors entering the Town from the North, South, East and West. The sign in the photo is located on the East side of Yonge Street, just north of Highway 7. The other three signs are located at Yonge and Bloomington, Major MacKenzie and Leslie, and Major MacKenzie and Bathurst. Our society's Publicity Convenor worked with the Chamber of Commerce to add the logo of our 102 year old society, featuring the Garden Sunshine Rose, to these signs. 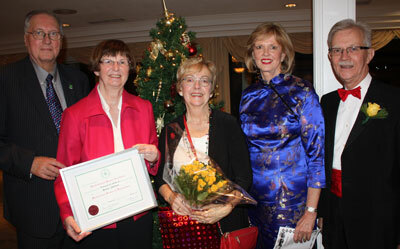 SNAPD Richmond Hill's Joanne Witt has posted fourteen great photos of our society's December 1st awards and holiday celebration to the January 2016 edition of SNAPD Richmond Hill. Photos include flower show tropy and special award winners, attendees having fun, and red bag raffle fundraising items. To see the full coverage of our event, click here.